While Chinese New Year is celebrated by over 1 billion people every year, you don’t have to be Chinese to enjoy the beauty and fun of this holiday! 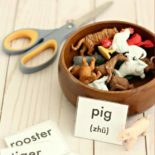 Chinese New Year (or CNY) is a great time to explore Chinese culture and your child will have a BLAST learning about Chinese zodiac animals in this fun Chinese New Year activity! 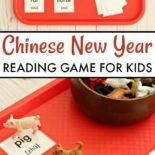 Read on to find out how to make this Chinese New Year game and maybe even teach your child a few words in Mandarin Chinese along the way! Growing up my go-to favorite place to eat on my birthday was the local Chinese restaurant, Mandarin Garden. My sister and I giggled over cuisine names on the menu (pu-pu platter, anyone?) and my father and I would have a contest to see who could eat the most kung pao chicken without taking a drink of water. While it wasn’t the most authentic Chinese cuisine it sure tasted amazing to us! 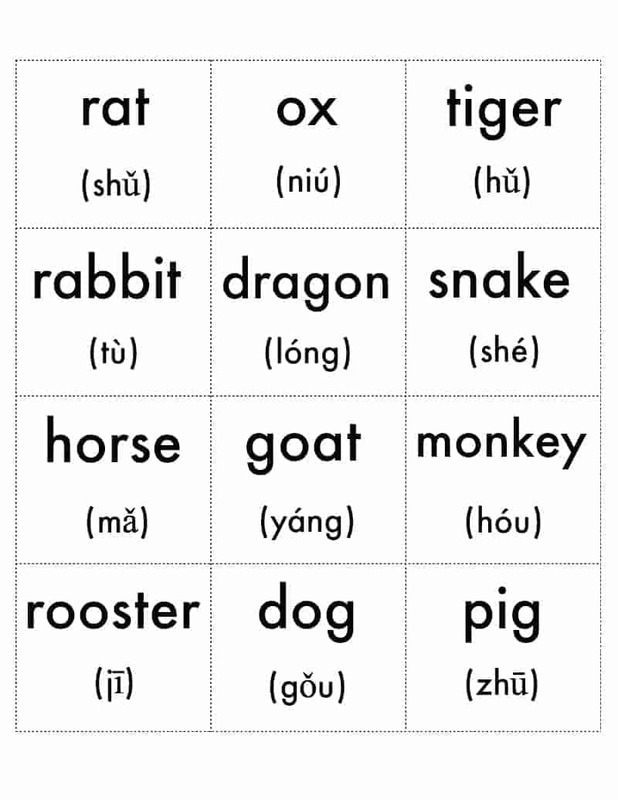 But the very best part was getting to read about the Chinese zodiac animals on our paper placemats. The Chinese zodiac is quite a bit different from the horoscopes we are used to! Chinese New Year is not celebrated on January 1st, because the original Chinese calendar followed the lunar moon calendar rather than the solar calendar (what most Americans are used to.) Instead of having different zodiac characters every month, the Chinese zodiac instead rotates through 12 animals every year. Each animal has its own set of special traits and characteristics. The year 2018 was the Year of the Dog and now we are moving forward into 2019, the Year of the Pig! 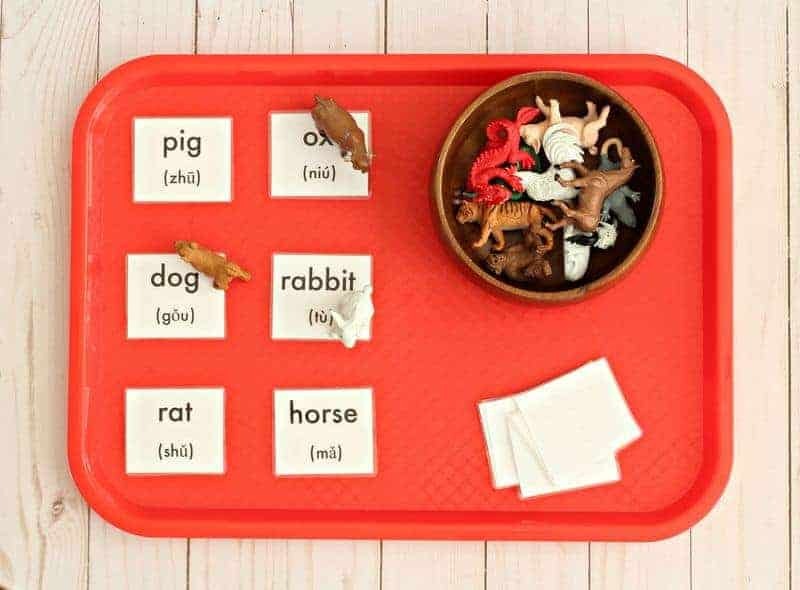 This game is going to target sight word reading for preschool/kindergarten aged children and work on their ability to problem solve and match a word to its corresponding animal figurine. The words are written in English, but there is also the Chinese pinyin pronunciation for the word below; advanced learners can impress their friends by learning some words in Mandarin Chinese! 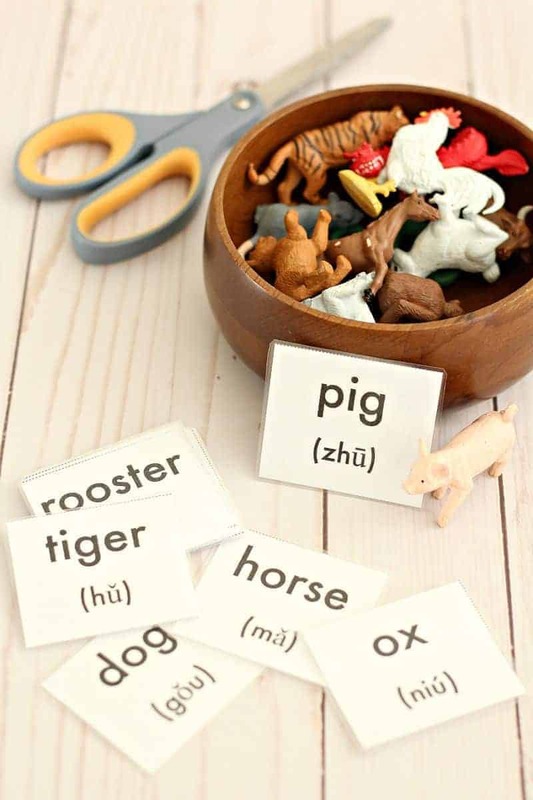 Here is what you will need to make this Chinese New Year activity. 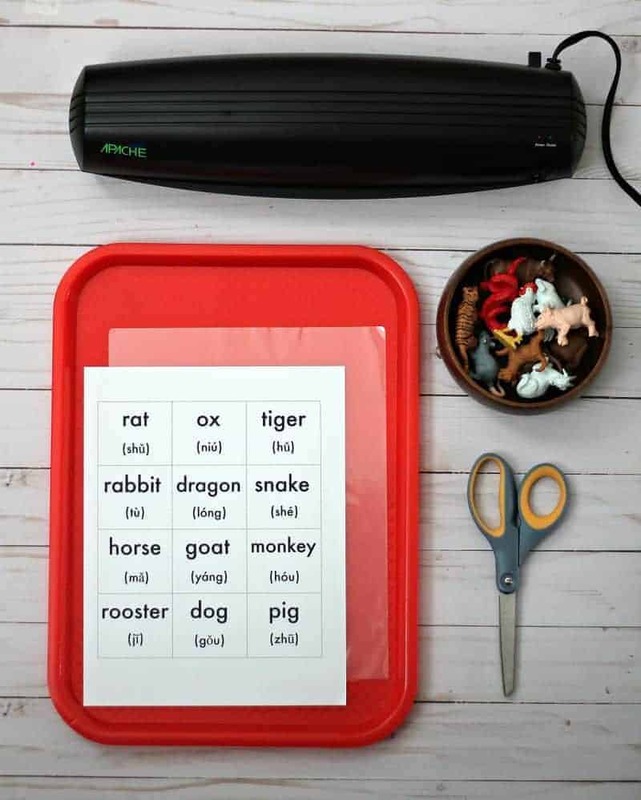 If your children are wild and unruly animals like mine, you may choose to laminate your Chinese zodiac word cards but this step is optional. I wanted ours to last a long time, so I went with laminated. 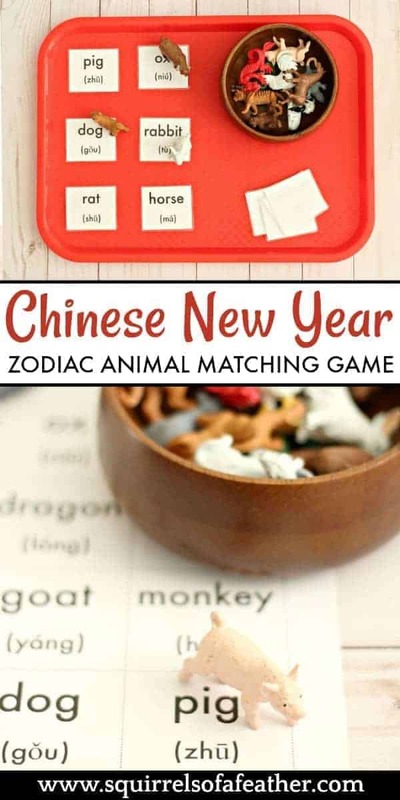 Below is your free Chinese zodiac animal printable for this Chinese New Year activity, simply click on the organe link and it will take you to your free printable! Here are the steps for making this CNY game. Gather everything you need to make this Chinese New Year activity. Have your printable ready. Taking the scissors, cut out all of the Chinese zodiac animal cards along the dotted lines. Try and keep the lines straight and even. Continue until all the cards have been cut into individual squares. If you have chosen to laminate your cards, place the cards inside the laminator pouch. When placing the cards, leave enough space in between each so that the laminator can heat and seal the laminator pouch well (see image below to view my spacing method). Laminate according to your laminator instructions. Now that your cards have been laminated, cut them out leaving a little bit of the clear edges extending past the paper so that the laminator doesn’t come undone. I also like to trim the corners because those suckers get SHARP! Protect your little ones tiny fingers and round the corners of the laminated cards a bit. 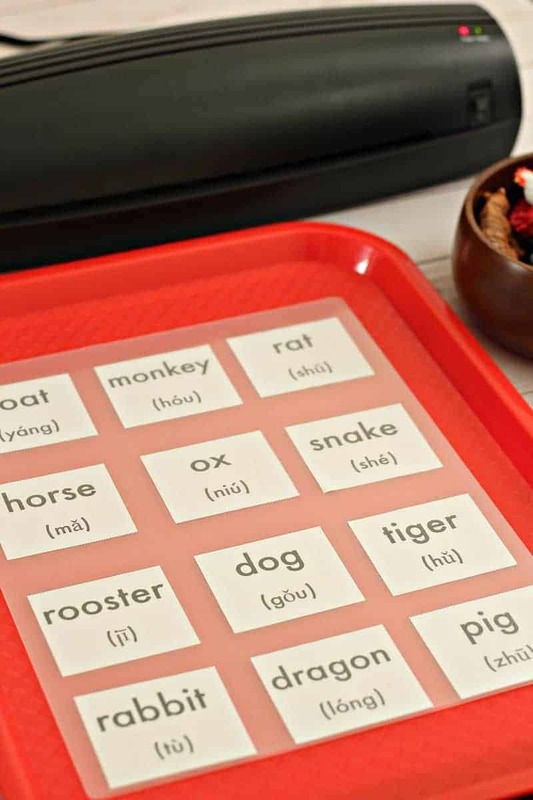 Now that you have all of your items ready here is how to play this Chinese New Year learning activity! 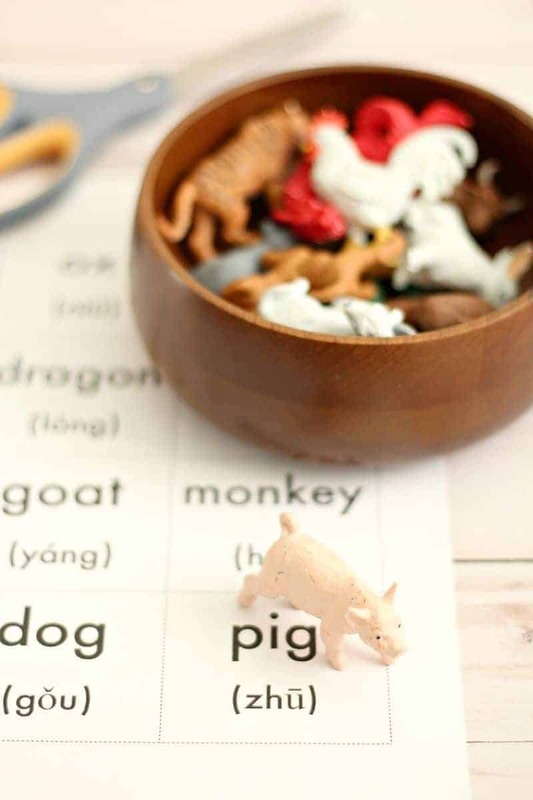 Set the tray on your chosen workspace and fill the bowl with the Chinese Zodiac Toob animals. How many cards you use depends on your child’s reading level. 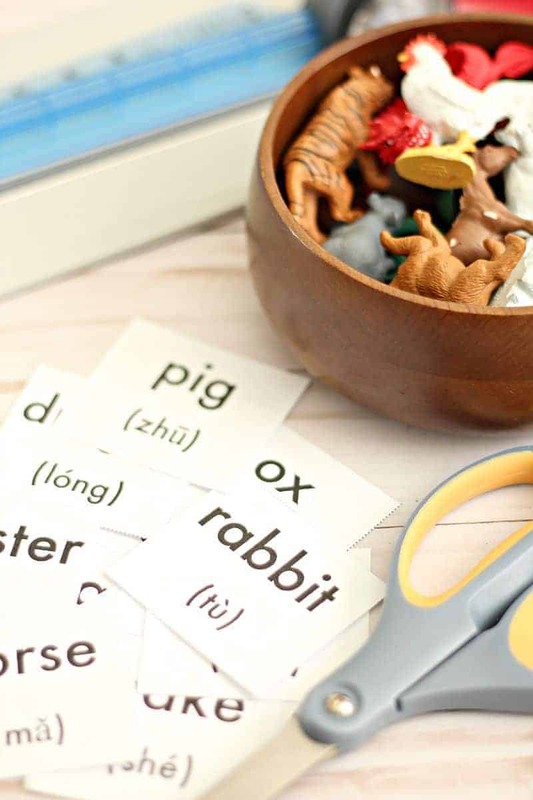 If they are beginning readers, start with one card. If they can read well, you may choose to start with three cards. Have your child try and select the right animals shown on the card and place them on the correct card. You can also ask them to read the words aloud as they go. If three cards are too easy, up the number of cards on the tray to six or even all twelve! I hope that you and your child enjoyed this Chinese New Year activity! Let me know if you have any questions in the comment section below — feel free to tell me what your Chinese zodiac animal is and if you agree/disagree with the characteristics of that animal! 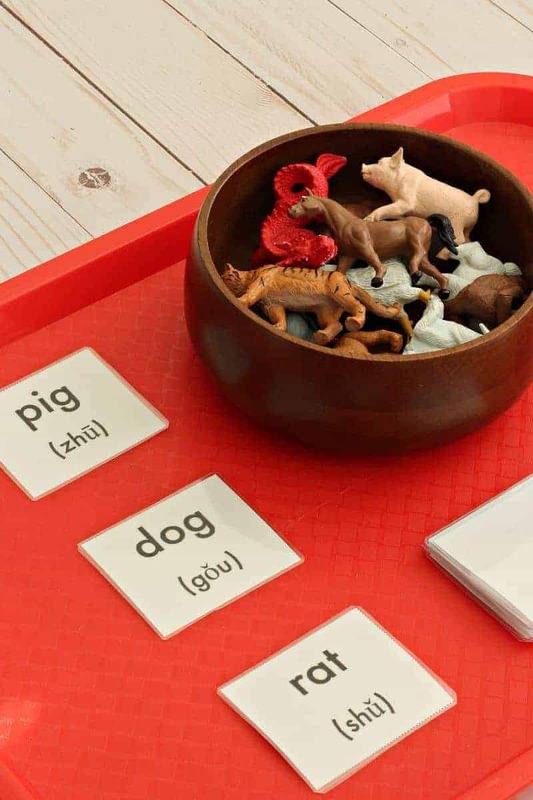 If you liked this activity, you may also enjoy this reading game that also uses Toob animals! I absolutely LOVE LOVE LOVE this post!!! What a great way to celebrate!!! Hugs and and an early HAPPY NEW YEAR!!! Thanks so much, Andrea! Zhu ni xian nian kuai le! (That means I wish you a happy New Year 😉 ). So cute and clever, as always! Guess what I got for Christmas…a laminating machine! I haven’t popped it open yet, but this gives me the itch! Laminating machines are the best when you have kids! I will look forward to seeing some nice crafts from that! This is a great sight word game, Marissa. 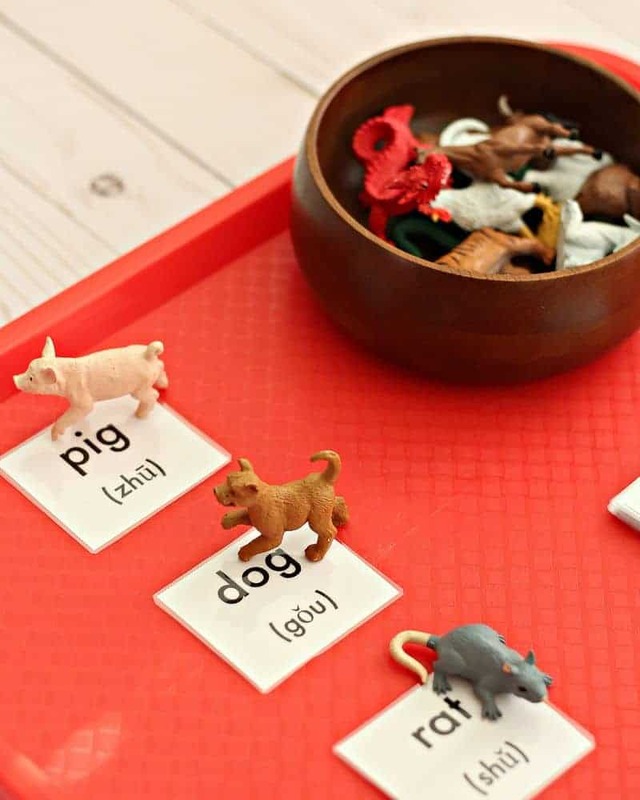 You are so creative with children’s learning games! This could be used for other themes, as well. Love learning about your Chinese history! I love this so much. I want to incorporate this into homeschooling. Fun game! Wishing a happy New Year to you and your family! Happy Lunar New Year to you and the fam as well! Not only fun but an awesome learning tool and something I can look forward to playing with my grandson someday. Pinning! Thanks and have fun, Michelle! Cute idea! Looks like fun — Happy New Year! Thanks, Christene and Happy New Year! I love this fun activity for kids. I always laminate all my kids’ stuff too. Great ideas and would be fun to do with my classroom.